Openers, bullpen games, unusual lineup construction. Why not? The Rangers have nothing to lose by turning tradition on its head. That was quite the miserable week of baseball. Texas has had one-win weeks before, but there was some excitement from the offense in at least one of the games. This week, even the six-run outing was punctuated by two Adrian Beltre home runs and…that’s it. Offense drives the game, and while I love a good pitching performance, no matter what team it is, we didn’t really see outstanding pitching from either side of the diamond. Combine that with some paltry offense, and six West Coast games, and you had a recipe for tedium. I mean, the Rangers’ offense was shut out by the Los Angeles Angels tossing out a bullpen game. Through seven innings, they didn't even manage a hit off six different Angels relievers. We’re two weeks away from the end of the season, and this week just made one feel extremely ready for it. The road trip to California didn't begin quite as poorly as the eighteen scoreless innings against Oakland a few weeks ago. Texas did go fifteen scoreless against the Angels, however, before Joey Gallo rocketed one to the left of the Sherwin-Williams paint can in left-center. On the whole, the Rangers were a paltry .198/.282/.323 at the plate for the previous slate of games over last week. Not only did they get shut out by the Angels’ bullpen game, but they were held to just two-hits with the first coming with two out in the top of the eighth inning. After the game-tying home run by Adrian Beltre on Saturday against Oakland, capping off a six-run game for the Rangers, the third baseman proceeded to come within one hit of tying George Brett on the all-time hit list with 3,153. That’s all we can say about the offense. Even though Jeff Banister tried several different lineup combinations, the whole group just looked tired. Maybe the jetlag will have worn off by the time baseball is played in San Diego beginning Friday night. The incredible renaissance of Mike Minor continues. A few starts into the second half, Minor cited the reason for success as fully mixing up his pitches. How exactly is he mixing them up now? We can actually pull a chart using information from Brooks Baseball. Minor hasn’t been using his fastball a lot less, but he’s upped his changeup use by nearly 10%. Remember earlier in the year that Minor had issues finishing off hitters with two strikes. He didn’t have a put-away pitch. A different set of stats from Brooks shows us something fantastic on that front: Minor’s curveball, which he’s used just 2% more during the second half, has hitters batting .000 against it. Hitters are also only hitting .132 against his changeup. Mixing in more off-speed and breaking balls has been a pointed reason for his success. We may have seen Bartolo Colon’s last start in the Texas uniform - and potentially his final start as a big leaguer. Having last opened a game on the mound against the Angels in Arlington last week, Colon was moved to the bullpen after allowing five runs in four innings. Colon hasn’t pitched since then, and there have been times where the 45-year old could have gotten into the game. Yovani Gallardo, who probably has a longer leash in the last two weeks of the season, has also faltered, losing his last two outings. Against the Athletics, the Fort Worth native went 4 1/3 innings. Against the Angels just a few days later, he only made it through three innings, giving up six runs. 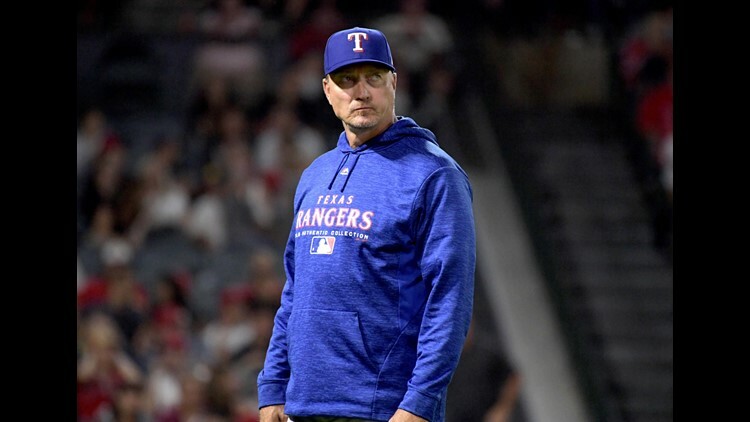 Manager Jeff Banister has already moved Martin Perez and Colon to the bullpen, and with Adrian Sampson and others looking to get eyes on them for the 2019 rotation, Gallardo gets to hold down the fort in the starting five if the notion of a starting rotation is even still a thing in Texas. The Jeffrey Springs/Ariel Jurado tandem didn’t prove to be as successful for Texas as it was in its first go ‘round. Well, the Jeffrey Springs part was. The problem, potentially was that it was working almost too well. It worked so well that Springs continued to pitch three innings, well beyond the requirement of an “opening” pitcher. Ariel Jurado, who had been sitting on the bench for those three innings, came in and could only record two outs while surrendering five runs. Call me crazy, but I don’t know that using Ariel Jurado, who you are looking at to be a 2019 starter, as the back part of the “opener” concept doesn’t seem to be productive for his growth. Nevertheless Springs has turned his audition as an opener into something of an extended look at the start of games. Just as Texas is probably about to fully recover from jet lag, they’ll have to get back on a plane in the early evening on Sunday and head back home. We’ll see how far the “opener” concept stays with the club, as that appears to be the preference for the starting pitchers during the San Diego series with reliever Connor Sadzeck already scheduled to pitch at the start of the game against the Padres on Friday night before giving way to "starting pitcher" Yohander Mendez. The Rangers really don't have anything to lose by trying things out. Do you buy the increasingly popular opener strategy currently being utilized by the Rangers or do you think it's a fad that they will be abandoned? Share your thoughts with Matt on Twitter @FisherWritesMLB.